The Rice women finished in 2nd place at the Conference USA Swimming & Diving Championships this past weekend. Rice was led by event winners in the 400 IM, 100 breaststroke, 200 breaststroke, and the 200 backstroke. Kaitlyn Swinney won the 400 IM in a time of 4:15.82. Marie-Claire Schillinger won the 100 and 200 breaststroke in 1:00.34 and 2:10.92. Alicia Caldwell won the 200 backstroke in a time of 1:57.17. The North Texas Mean Green swim team finished in 4th place out of 6 total teams. 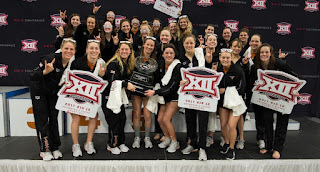 The University of Texas Women won their 5th consecutive Big 12 Conference title and 15th overall conference title on Saturday finishing in 1st place out of five teams with 991 points. Madisyn Cox led the way for the Horns with 3 event wins. She won the 200 IM in a time of 1:52.82, the 400 IM in 4:01.15, and the 200 breaststroke in 2:07.23. The TCU women finished in 5th out of 5 teams. The University of Texas men won their 38th consecutive conference title and 21st consecutive Big 12 Title on Saturday finishing the swim meet in 1st place out of 3 teams with 1081 points. Will Licon and Joseph Schooling led the way for the Horns by winning two events each. Licon took the victory in the 200 IM in 1:42.35 and the 200 breaststroke in 1:49.89. Schooling won the 50 freestyle in 18.76 and the 100 butterfly in 44.06. The TCU men finished in 3rd out of 3 teams. The Texas A&M women ended day one of the Southeastern Conference Championships in the lead and never looked back. The Aggie women won 2 out of 5 relays in route to 1304 points over second place Georgia with 1113 during the four day competition held in Knoxville, Tennessee. The Aggies finished 1st in the 800 free relay in 6:57.90 and the 400 medley relay in 3:29.81. The women were led by Sarah Gibson who won three individual events and Sydney Pickrem who won two and finshed second in one. Gibson won the 500 free in 4:38.92, the 100 fly in 50.71, and the 200 fly in 1:52.64. Pickrem was second in the 200 IM 1:53.64, first in the 400 IM 4:02.25, and 1st in the 200 breaststroke 2:06.65. 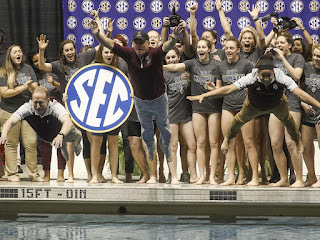 This was the Texas A&M women's 2nd consecutive SEC Championship and their 6th overall championship victory. The Texas A&M men finished in 7th place out of 10 teams. 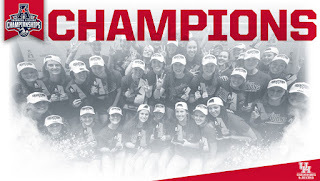 The University of Houston women's swim team swam their way to their first ever conference championship this past weekend at their home Campus Recreation & Wellness Center Natatorium. The Cougars used a wide range of depth to finish in the top spot with 772 points. Head Coach Ryan Wochomurka was named Women's Coach of the Year and University of Houston's diving coach Bob Gunter was named diving coach of the year. SMU women finished in 2nd place. The SMU men's team finished in 2nd place. Meet Mobile might be a better option here as well. As of 5:54 PM, Live Results are working! 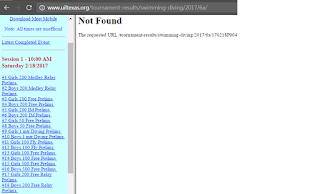 Looks like meet administration forgot to update events after the girls 200 freestyle. If you're looking for results, you'll have to check on Meet Mobile. Prelims for 6A have completed. You can check the Meet Mobile app for results. As of 2:40 PM, Live Results have not been updated since the girls 200 freestyle. Live Results have been updated as of 5:55 PM. I will post a link to the live results as soon as it's available. Tehya Morgan of Frisco Independence was added in the 5A girls 100 freestyle because of a scratch by Andrea Unwin. There's a good chance I got something wrong here. Please let me know if any corrections need to be made. Edit 1: Missed some teams from Region 8 in the boys 200 free relay. These results are a compilation of times from meet mobile. I could have missed a DQ somewhere. Please email me for any changes and I'll take of them asap.